Scottish Aviation has a long history in the world of British aviation manufacturing and is renowned for the development and manufacture of the robust military STOL aircraft, the Scottish Aviation Pioneer and Twin Pioneer. After the demise of Beagle Aircraft, Scottish Aviation took over the production of what became known as the Scottish Aviation Bulldog. Designed as a dedicated training aircraft, the Bulldog filled the requirement for a basic trainer for many air forces around the world. Blackbox Simulation have been producing a range of aircraft add-ons for over 15 years. 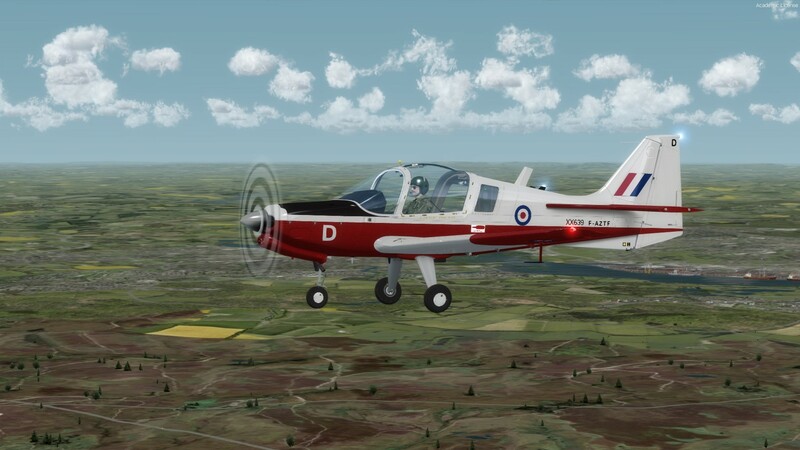 The Scottish Aviation Bulldog V2 is certainly not as complex an aircraft as some of Blackbox Simulation's other products, but it has been modelled beautifully to capture the essence of this great British training aircraft. An aircraft with fantastic handling characteristics, this wonderful little training aircraft has a quirky appeal. The Scottish Aviation Bulldog is a two seat, side by side, training aircraft. It is a low wing, cantilever monoplane design and is powered by a Lycoming IO-360-A1B6, opposed piston engine. Originally designed by Beagle Aircraft as the B.125 Bulldog, the prototype first flew on 19 May 1969 at Shoreham Airport. An order for the Swedish Air Force followed, however, Beagle Aircraft went into receivership before production commenced. The production rights, including the Swedish order, were taken over by Scottish Aviation and the aircraft was produced at Scottish Aviation's facilities at Prestwick Airport. Production was later taken over by BAe as part of Scottish Aviation being part of the merger resulting in the forming of BAe. Production ran from 1969 to 1976 with the total production reaching 340. The RAF was the largest operator of the type with 130 aircraft, followed by the Swedish Air Force with 78, with the remainder being exported in various quantities to 10 other countries. 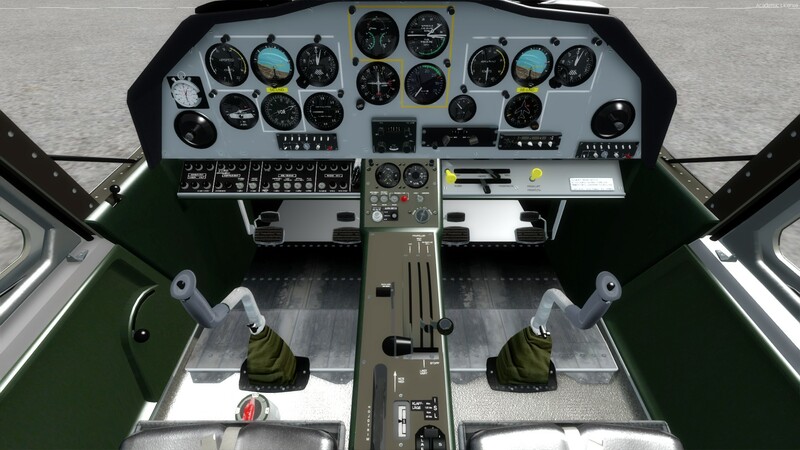 The Blackbox Simulation Scottish Aviation Bulldog V2 is currently available direct from Blackbox Simulation as a download only product. It is normally priced at €15.99, or the equivalent on currency cross rates. The download file size is 110MB and it requires 2GB of HDD/SSD space for installation. The installation process is intuitive and requires you to connect to your Blackbox Simulation account to verify the registration code and activate the product. The installation process also installs the Blackbox Simulation PreFlight Manager application. dynamic reflection (P3D) and all surfaces bump mapped. The PreFlight Manager application provides the ability to manage and configure various aspects of your Blackbox Simulation products. After installing a product, the "Settings" section of the PreFlight Manager provides the ability for the user to log in to their Blackbox Simulation account and register the product with the serial number provided at the time of purchase. Also under the "Settings" section is the ability to set "Default Weights" and "Default Units Of Measure". This is where I encountered the first problem with this application as the "Default Weights" fields are restricted to a range of weights which are restrictive and / or irrelevant to the Bulldog. According to the default weight settings, the "Flight Crew" cannot weigh any more than 220.462 lbs. So, it is too bad if you are a solidly built 6' 4" guy weighing 285 lbs. The "Fleet Management" section displays the installed products and respective liveries and provides the ability to individually uninstall liveries. The "Payload" section provides the ability to set various aspects relating to the aircraft's configuration, pax, cargo, and fuel. As some of this information is populated from the defaults in the "Settings" it can be unrealistic or restrictive in the range of figures used. The remaining section is "Dispatch", but this section does not support the Bulldog. A final aspect about the PreFlight Manager is that it is installed to a default location under C:\Program Files (x86) with no option to install it an alternative location. General Overview and Exterior. Take one look at the Bulldog and its design as a training aircraft, with its high visibility cockpit canopy, is unmistakable. It is simple, yet somehow appealing in its lines. Comparative to the Bulldog's rather bulky fuselage, the nose is somewhat slender, giving the aircraft a slightly disproportionate appearance. The high quality of the external model is absolutely stunning and the level of detail is impressive. 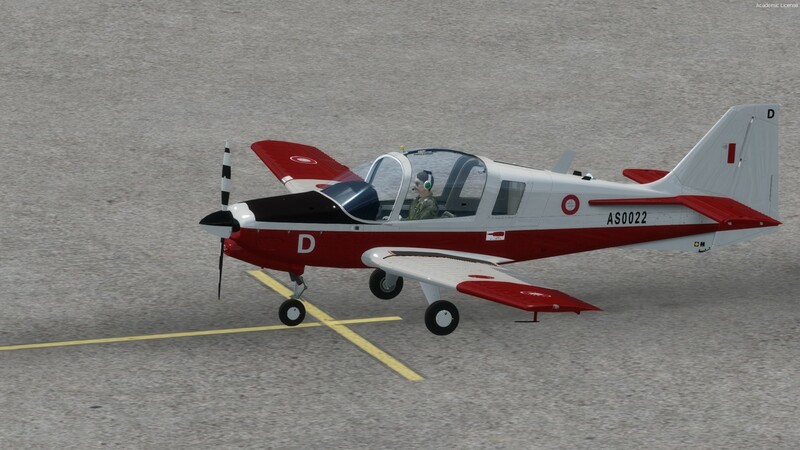 Blackbox Simulation have done an excellent job on the external modelling of the Bulldog and it beautifully captures the simple design and construction of the aircraft. 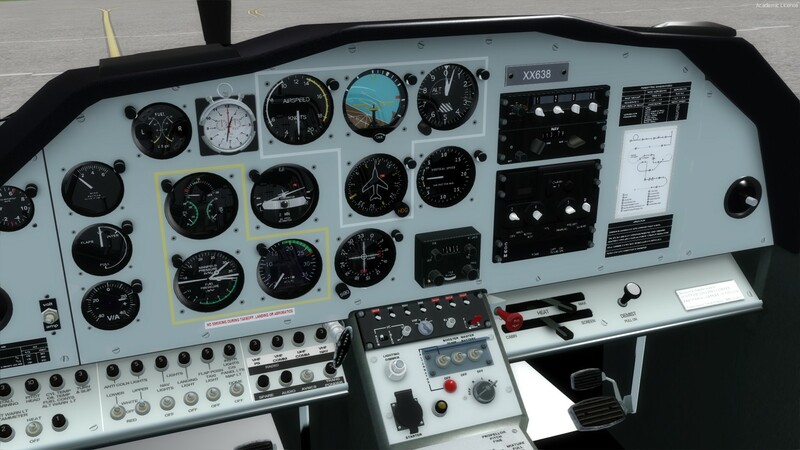 Flight Instruments, Avionics, and Aircraft Systems. As for the "office", the cockpit of the Scottish Aviation Bulldog is the quintessential training aircraft. 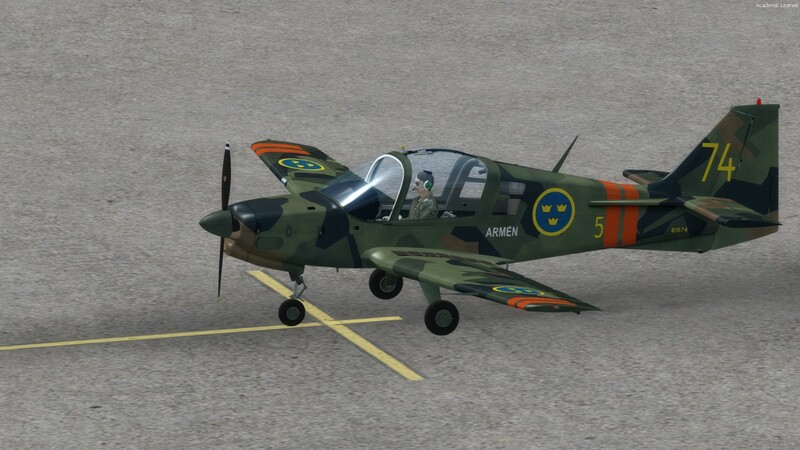 There are two panel configurations provided, a standard configuration, and one specific to the Swedish Air Force SK 61 variant. In each case though, they are an all analogue panel. 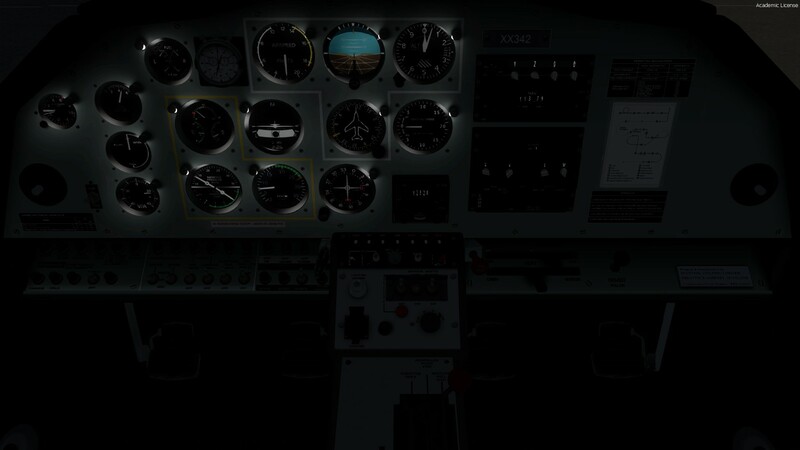 The standard panel has a slightly strange configuration in that the primary flight instruments are located centrally on the panel. Whilst this seems strange at first, it is actually very obvious when you remember that the Bulldog was expressly designed as a two seat, side by side training aircraft, and so the central position of the primary flight instruments provides a balanced view for both the student pilot and instructor. As for navigation, there is a single NAV radio and associated gauges – nothing else. So, it is back to good old basic radio navigation techniques in the Bulldog. The Scottish Aviation Bulldog includes the typical range of animations you would expect for such an aircraft. In addition, the static elements of the cover, wheel chocks, tie down, and remove before flight flags are a nice touch. The lighting, whilst basic is reasonable for the model as it is. The engine sound is also a reasonable representation of what you would expect from the Lycoming IO-360 engine, if not a bit austere and lacklustre, and it provides very good stereo separation in both the internal and external views. Models and Liveries. 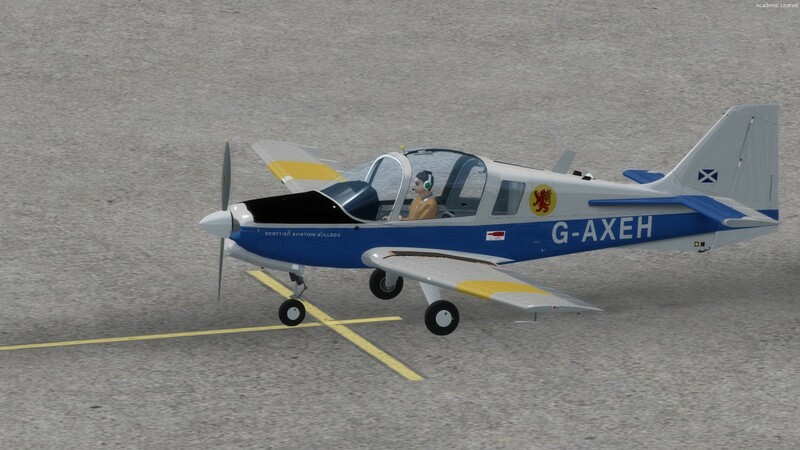 The Blackbox Simulation Scottish Aviation Bulldog is provided in two model choices with a total of six individual liveries (a selection showing below). 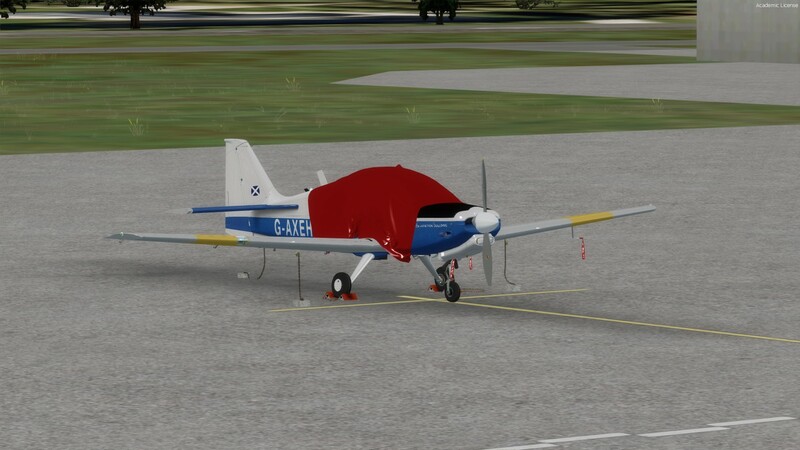 There is an additional blank texture available for aircraft painting enthusiasts. Displaying high quality, the surface textures, reflections, and shadings, give each aircraft an excellent appearance. However, a lack of any kind of scrape and scuff marks, dirt, exhaust, oil, or grease stains, whilst giving the aircraft a pristine look, is unnatural. 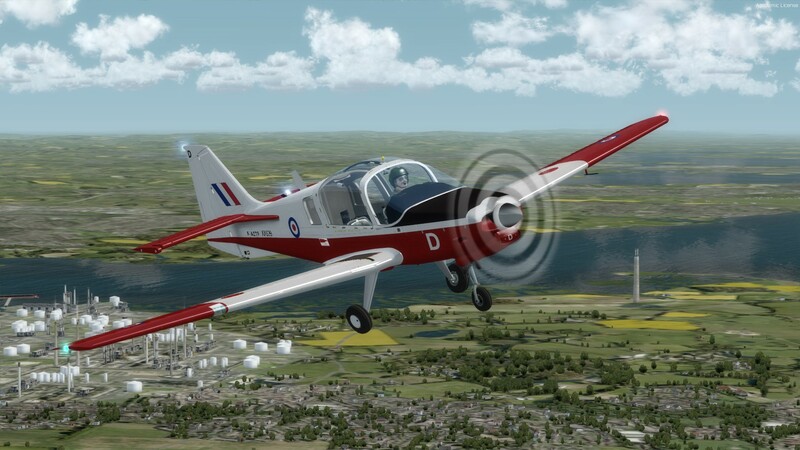 The rendition of the Blackbox Simulation Scottish Aviation Bulldog is highly detailed and the visual quality is excellent, providing a reasonably faithful representation of the real world aircraft. 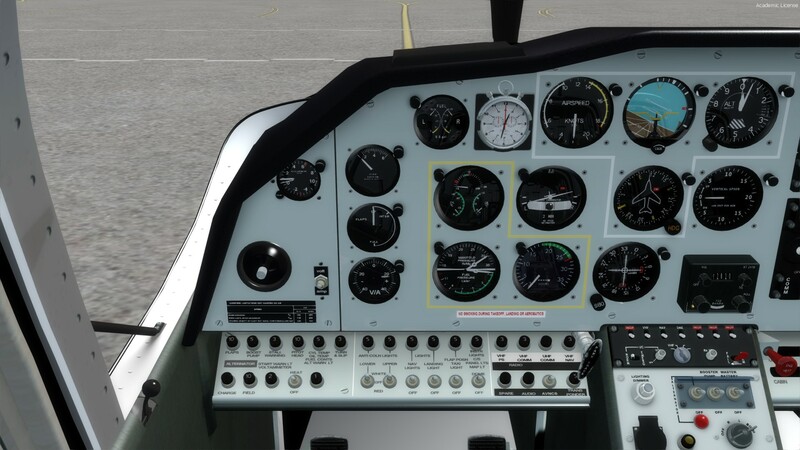 Most major elements of the cockpit are clear and easy to read, albeit that some gauges lack clarity unless viewed at high zoom levels. Otherwise, the texture quality was very good. There was a lack of alternative cockpit views which could have assisted in viewing gauges. 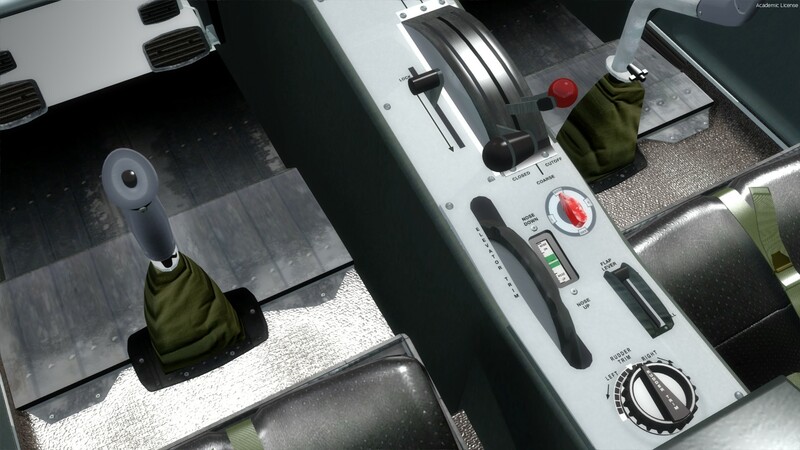 In the standard cockpit configuration there appeared to be what looked like an ADF radio, however, this was inoperable, serving no purpose other than filling a large space on the panel. You have to question why this was there (other than being a space filler) and / or why it was not made functional. Additionally, the spelling of "propeller" on the throttle quandrant, whilst not entirely incorrect, uses the less common form of "propellor", and the visual perspective of the propeller from inside the cockpit did not look natural and was more noticeable when it was spinning. One major visual issue was when the propeller pitch was set to coarse, the propeller contacted with the intake below the spinner. Nonetheless, any other noted visual variations were minor and are considered to be related to real world production variations or a degree of artistic licence on the part of the developer. 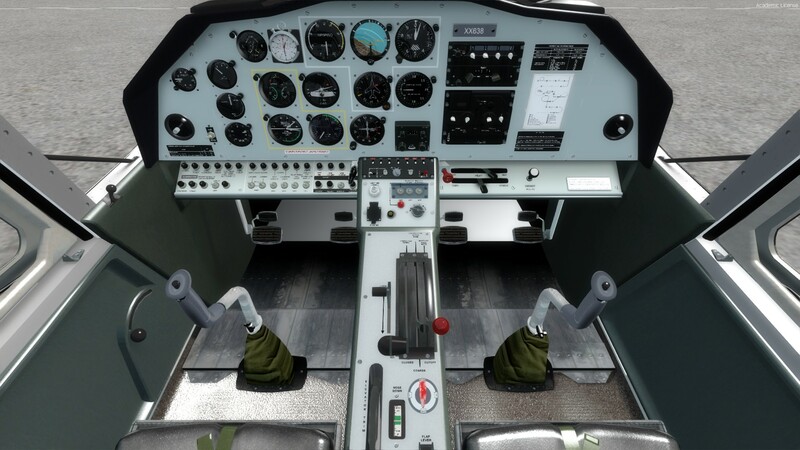 Any noted issues and variations with cockpit functions and operation were considered minor and / or in the interests of simplifying the function for practical flight simulator use. The general characteristics and performance specifications for the Scottish Aviation Bulldog are provided in the table. This is based on data from the official Scottish Aviation Bulldog Pilot Operating Handbook, data provided by Blackbox Simulation, and general research sources. Some of this data varies between sources and also may be an approximation due to variances in data and the specific aircraft modelled by Blackbox Simulation. A specific Test Flight was conducted to test the flight performance of Blackbox Simulation's Scottish Aviation Bulldog. The flight was conducted in clear weather with a full fuel load. A cruise altitude of 5,500 ft was adopted and the route distance was particularly chosen to provide a basis upon which to test the range characteristics of the aircraft. The aircraft was very easy to taxi. With flaps set to INTER, aircraft rotation occurred at approximately 60 KIAS with a rate of climb on climb out of 1000 ft/min. The Scottish Aviation Bulldog is nimble and agile, consistent with its aerobatic capabilities, and responds nicely to control inputs. Applying typical cruise settings for the aircraft, the Bulldog trims out and cruises beautifully at approximately 120 KIAS. The Test Flight confirms the modelling of the aircraft for speed performance to be what would reasonably be expected of this aircraft. Configured for landing, with full flaps, and trimmed for a descent rate of approximately 500 ft/min, the aircraft's approach speed was approximately 68 KIAS and it touched down at approximately 60 KIAS, with a landing roll-out comparable with the specifications for the aircraft. In testing the accuracy of the instruments, based on the measured Test Flight, the speed indications on the airspeed indicator, were consistent with the averages measured. Additionally, when establishing a set rate of climb on the vertical speed indicator, the respective gain in altitude on the altimeter was achieved within the measured minute, and a standard rate turn was achieved within the measured two minute period using the turn coordinator. The performance of the Blackbox Simulation Scottish Aviation Bulldog was what could be reasonably expected of this aircraft. The general handling characteristics are good, with the aircraft being very responsive to control inputs. Flight Reference Cards, Bulldog Series 120, Normal Drills, 34 pages. These manuals are scanned copies of the real world manuals. As such they contain a wealth of information. However, to anyone other than a real world pilot or an extremely experienced and / or procedures focused flight simmer, there is just far too much and irrelevant information provided. To the average flight simmer, the eyes would glaze over and roll into the back of their head after the first few pages. As an example, I had to scroll all the way to page 113 of 170 (because there is no index) before I found a description of the layout of the instrument panel, and then it bore no resemblance to the instrument panels represented in the aircraft model. Additionally, the quality of the scanning of some of the pages is of a poor standard. If these manuals were provided as a supplement to a basic manual for the aircraft add-on, they would be ideal, however, providing scanned copies of real world manuals as the manual for a flight sim add-on product is just laziness and unacceptable. 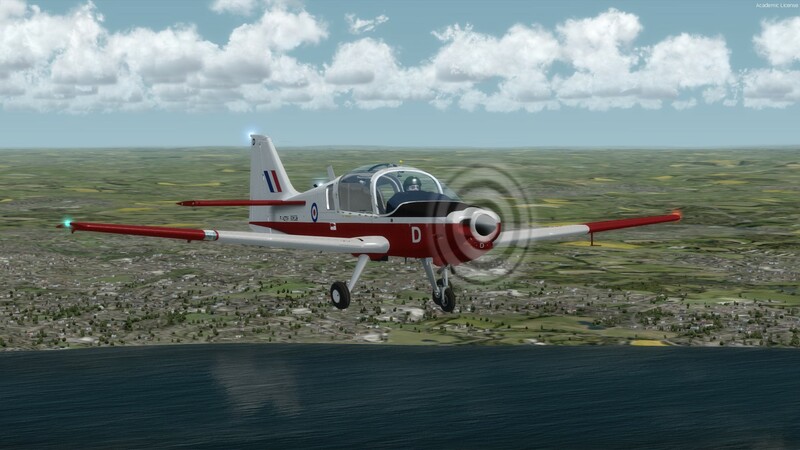 The Blackbox Simulation Scottish Aviation Bulldog is a simple aircraft add-on and is priced appropriately. 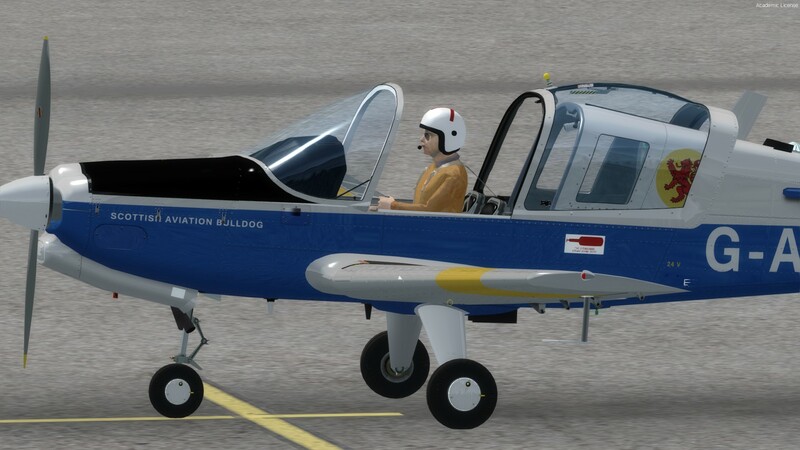 At €15.99, the Value for Money for the Blackbox Simulation Scottish Aviation Bulldog is considered excellent. 3.0GHz CPU, 2GB RAM, 512MB graphics card, and 2GB available HDD space. Lockheed Martin P3D Version 3.4..22.19868. Additional Major Add-ons. Active Sky Next, FS Global Ultimate region series, Orbx FTX Global BASE, Orbx FTX Global VECTOR, Orbx FTX Global openLC series, Orbx FTX region series, Orbx FTX airport series, and Orbx FTX Trees HD. The Blackbox Simulation Scottish Aviation Bulldog beautifully captures the simple design of this wonderful aircraft. From the annals of British aircraft manufacturing, it is a basic aircraft and true to its heritage as a training aircraft. This product has great potential to be better, but there are some opportunities missed and overlooked obvious errors with the Bulldog which detract from it. The lack of an appropriate manual, using scanned copies of real world manuals as a replacement, was disappointing and unacceptable. 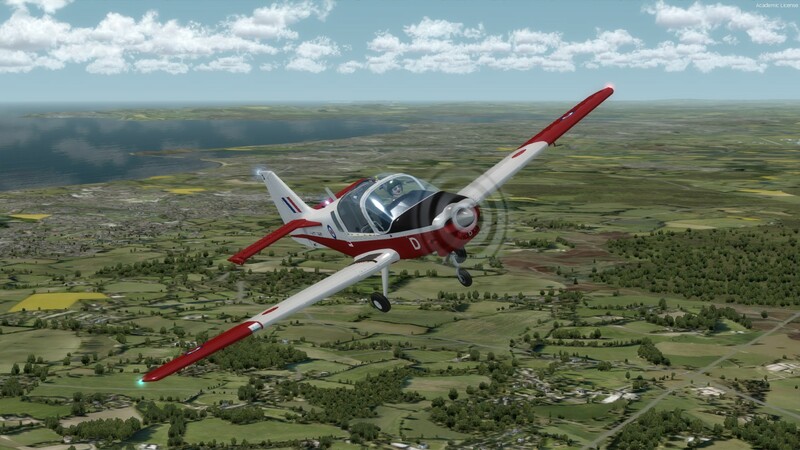 Nonetheless, the Scottish Aviation Bulldog is a delight to fly, exhibiting the great handling characteristics you would expect from such a training aircraft, including a full aerobatic capability. Nicely priced, the Blackbox Simulation Scottish Aviation Bulldog will provide much enjoyment to those who enjoy this category of aircraft. 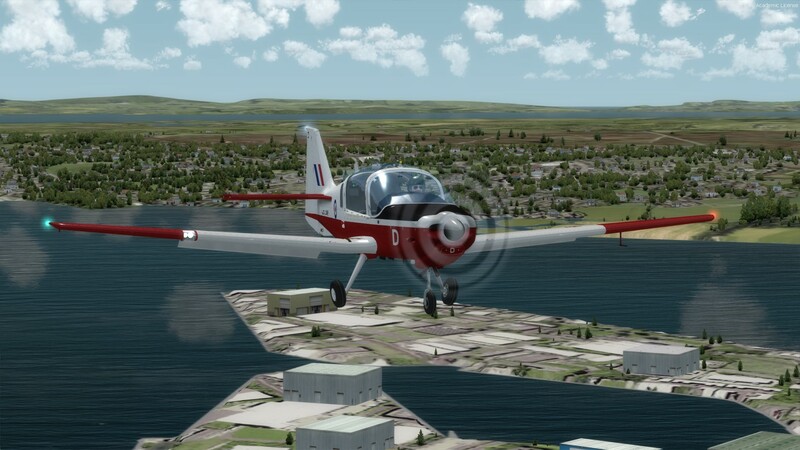 The Blackbox Simulation Scottish Aviation Bulldog is a wonderful aircraft add-on product and one which will appeal greatly to general aviation flight simmers who enjoy flying basic training aircraft with the additional thrill of some aerobatic flying. 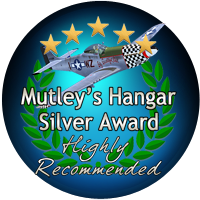 with a "Highly Recommended" and a Mutley's Hangar Silver Award.